John concentrates his practice in the areas of commercial transactions and litigation, real property and zoning, municipal and public entity law, and tax assessment challenges. John has represented developers and lenders in commercial real estate transactions, and has over 25 years of experience in public sector and local government law as a public official or legal counsel. John also has considerable experience in litigation of business disputes. After graduating from law school John practiced with Conboy, McKay, Bachman & Kendall of Watertown from 1998 until his appointment as Jefferson County Attorney in 2000, a position he held until 2006. 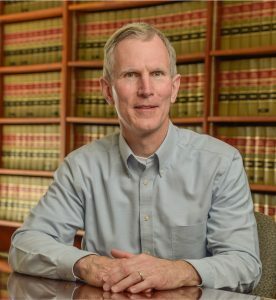 As County Attorney, John litigated in State and Federal Courts in a wide variety of matters including defense of tort claims, civil rights suits and Article 78 proceedings, and was involved in extensive municipal transactional work, real property tax foreclosures, public employer relations, public works construction-related matters, appellate practice, collections, and building code enforcement. Prior to joining Nolan Heller Kauffman, John worked as an associate with the Syracuse firm of Menter, Rudin & Trivelpiece, P.C., where he handled a variety of litigation and transactional matters including commercial real estate, local development corporation and industrial development agency representation, real property tax assessment challenges, and business and corporate formations and sales. Prior to pursuing a career in law, John served as Deputy County Administrator and County Administrator for Jefferson County over a period spanning 11 years. While in law school John served as a legal intern to Hon. James C. Tormey, III, New York State Supreme Court Justice. John is presently an elected Town Councilman in the Town of Malta, New York.